HDL Works is a supplier of front-end VHDL / Verilog design tools, translators and an FPGA / PCB pin assignment verification tool. HDL Works has over 15 years experience developing HDL tools. All tools are available on Windows and Linux operating systems. EASE Graphical HDL Design tool. Combines block diagrams, state diagrams, truth tables and HDL code. It will give you a complete overview of any VHDL or Verilog design in seconds. Features include verification, linting and HTML generation. IO Checker When using large FPGA's on a PCB making sure that the FPGA pins are connected to the right signals is a cumbersome task. 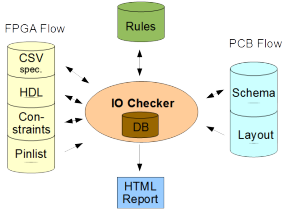 IO Checker uses rules (based on regular expressions) to match the signal names in both the FPGA and PCB design environment. Scriptum A text editor focused at VHDL and Verilog, using a Multiple Document Interface. ConnTrace ConnTrace is used to verify the connections between various PCB's, Independent on how your PCBs are connected (backplanes, connectors and/or rear panels). ConnTrace will present a view of the connections in seconds. FLDL2HDL Fujitsu FLDL netlist and FTDL test format translated into a VHDL or Verilog netlist. HDL Works will be presenting IO Checker on the FPGA Kongress in Munich. and many lectures are given on FPGA design.